Founded in 2007 Jiangsu Zeversolar New Energy Co. Ltd. is a high tech enterprise that specialises in the R & D and manufacture of solar power inverters. With leading industry professionals Zeversolar is a wholly owned subsidiary of the SMA Group, one of the world leaders in solar inverter manufacturing. The SMA Group focus on advanced research and development of futuristic technologies has allowed the group to consistently account for 40% of the global market of solar power inverters. Holding over 400 global technology patents the SMA Group and Zeversolar compliment each other by combining the best of two worlds: Chinese efficiency and German quality standards. Zeversolar are driven by the idea of a solar-power revolution. By creating reliable, affordable and easy-to-use solar inverters for all kinds of solar power systems, they are revolutionising access to solar power and bringing energy to everybody. Checkout the following video about the Zeversolar company. The Zeverlution range are reliable and affordable solar inverters. By introducing a patented inverter topology the Zeverlution requires less power electronic components for increased reliability while also reducing the weight of the inverter by nearly 50%. With an efficiency of 97.5% and wifi communication as standard the Zeverlution is a reliable and affordable choice for your solar power system. Zeversolar Zeverlution 1.5kW, 2kW and 3kW inverter datasheet here. 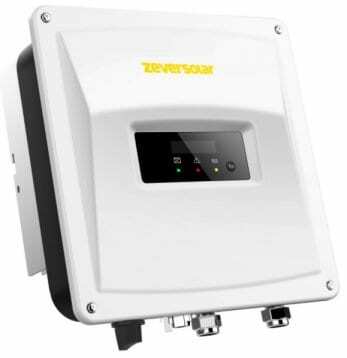 Zeversolar Zeverlution 5kW inverter datasheet here. Wanting to connect your Zeversolar solar inverter to the ZeverCloud online monitoring portal? find out how to setup the Zeversolar WiFi monitoring portal here.